The Three Paths Of Grandmaster Huang, Chien-Liang: What Will The Next 30 Years Bring? 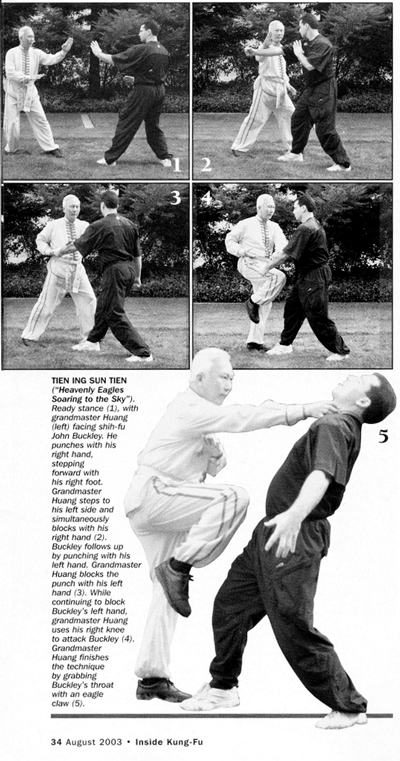 The following article was reprinted with permission from the Aug. 2003 issue of Inside Kung Fu Magazine. For purchase and subscription information, contact Inside Kung Fu at cfw@pcspublink.com, or P.O. Box 461621, Escondido, CA 92046, (800) 877-5528. Most martial arts masters fit into one of three categories. Some martial arts masters focus on teaching, and running significant schools: they manage the schools where we study – our introduction to the martial arts world. Other masters spend their time in the complex world of international competitions and martial arts federations: they develop the tournaments where we compete and knit together the governing organizations that manage these tournaments. The final group of masters devote themselves to honing their own skills and abilities. They have a handful of equally dedicated students and surface only once every few years, content to spend their time on achieving the higher levels of martial arts mastery. Grandmaster Huang, Chien-Liang, the 64th generation lineage heir to the Tien Shan Pai system of martial arts, is therefore unusual: a master who excels in all three areas – teacher, promoter and specialist. Yet his work is linked by common threads: tradition, discipline, respect and integrity. You can see it in the Master just as you can see it in his students. Grandmaster Huang is one man chasing three paths. Taking on these three paths wasn’t easy. But then again, for those who know him, he never takes the easy way. Perhaps that is why he is so accomplished in these three areas and why there is more work to be done. As fitting someone schooled in the traditional ways, to understand the future, we must first understand the past? This year marks an important milestone in the life of Grandmaster Huang. Thirty years ago, in 1973, a twenty five year old Huang arrived in the United States from Taiwan, Republic of China. He had recently completed college in Taiwan, spoke little English. Nevertheless, one of Huang’s older martial arts classmates hired him to teach at a martial arts school in Washington, D.C. Thus began an important journey for Grandmaster Huang, who has made his mark on traditional Chinese martial arts in the United States, and the world, beginning with this simple flight to the U.S. When Huang first arrived, some of the students at the school gave him an English name – Richard – which never really suited the traditionally minded Huang. Instead, he used his given name “Wee Hoo Huang” for quite a few of his early years. Around 1985, Huang changed his name to Huang, Chien-Liang (the Chinese put their last name first and first name last, the opposite of what we do in the U.S.). The “Chien-Liang” name came from Huang’s Shih-fu, Late Supreme Master Wang, Chueh-Jen. Wang bestowed the Tao name on Huang when he became Wang’s sole disciple. Following the traditional model, Huang adopted the Tao name as his own. Late Supreme Master Wang, Chueh-Jen (1910-1990) is little known in the U.S., however, there is no doubt that Wang has earned his place in martial arts history. He was born around 1910 in Szechuan province, in the western part of China. Wang’s father, a wealthy man and martial artist, arranged for top Masters to train members of the Wang family. It was here that Wang learned the Tien Shan Pai style (literally translated as “Celestial Mountain Style” – after mountains of the same name in western China) and honed his martial prowess as a young man. In 1928, the Chinese government supported the foundation of a national martial arts university in the city of Nanking, then the capital city of China. In recognition of the Chinese martial arts as a unique contribution of China to world culture, they referred to the martial arts as Kuoshu, literally, the “National art.” From this university, named the Central Kuoshu Academy, the call went out to the top martial artists in China to participate in the development of a common curriculum of martial arts. The members of this first class – the so-called Professor-Research class – would then take this curriculum and teach it in the other provinces and regions in China. Only the top Masters in China were accepted into the first class. And among those Masters were an 18 year old Wang. Already, at a young age, Wang had established himself as a serious martial artist. After 1928 and before 1949, Wang used his martial arts knowledge to teach fighting techniques to special agents of the national government. During this period, China was involved in World War II, fighting the Japanese, and later, a Civil War, between the national government and Communist rebels. At the conclusion of the Chinese civil war in 1949, the Communists defeated the national government. Wang, like many people in China, left the mainland and moved to the island of Taiwan. Other people from China fled to parts of Southeast Asia, including Singapore, Malaysia and Hong Kong. Once resettled in Taiwan, Wang started teaching martial arts again. The influx of refugees from the mainland brought accomplished martial arts Masters, including many northern style Masters, to Taiwan. Wang’s students performed well in early full-contact Lei Tai style fights in Taiwan during 1955 and 1957. In 1967, Grandmaster Huang met his future teacher Wang. As a child, Huang has been plagued by asthma and initially sought relief through Tai Chi Chuan practice. The Tai Chi Chuan routines improved his asthma condition, and during the next 36 years, Huang never had another asthma problem. After about one year in the Tai Chi Chuan program, Huang started in the kung fu curriculum as well. Studying from Grandmaster Wang in those days was no easy feat. Wang was the so-called “Old Man?straight out of the martial arts legends: he was disciplined and unsparing. He worked his students hard and he expected results. At first, Grandmaster Wang taught only the forms to his students; after sufficient time to assess his students?character and progress, he would then teach the fighting techniques. Wang structured his training so that each student needed to pass a test of proficiency in order to learn the next fighting technique. Many students could not make it past the first test. Huang learned a great deal during these first six years. A traditional teacher like Wang typically taught a slow pace, so Huang was just beginning to see what his teacher had to offer. These were difficult – if rewarding – years. Huang tolerated the tough conditions. He trained on a dirt floor, even for fighting techniques like throwing and sweeping. He rode his bicycle for a half an hour each way to practice, even during the winter. And upon returning home, he would wait some time for the charcoal heater in his room to heat the water enough for a warm shower. Huang persisted, even as his other classmates soon tired of the trials of teacher and training conditions. The toughest years, perhaps, were still ahead for the young Huang. In 1973, Huang moved to the United States to teach martial arts in Washington, D.C. He stayed there for about a year and a half. One of his students suggested that Huang should move to Cincinnati, Ohio. The move wasn’t easy. Traditionally, martial arts teachers would not advertise. In Taiwan, the only people that would advertise would be people whose martial arts weren’t of a high quality. The traditional thinking dictated that a good teacher would attract students on his reputation alone. So Huang didn’t advertise. In America, as Huang soon discovered, things were not like Taiwan. Huang ended up working odd jobs to pay his bills, spending part of his time at the school teaching, and the rest of his week at a restaurant – working at the bar or managing the restaurant. Despite these hardships, he persisted. Huang returned to Taiwan several times – particularly in 1975 and 1978 – when he could, to visit his teacher and to continue his personal training. And his school in Cincinnati continued to grow, even if it was modest by the standards of today’s schools. For Huang, his first big payoff came in 1980, when he brought a six of his students as a team to the 3rd World Kuoshu Championship tournament in Hawaii. This world tournament, sponsored and organized by an international Kuoshu federation in Taiwan, featured top Chinese stylists from around the world. Although they were nervous about the competition, Huang’s students performed surprisingly well. They captured top placing in several divisions, including forms and full contact fighting. In total, they took home six trophies. Huang stayed in Ohio for the next three years, until 1983. During these years, and for the following few years, Huang’s teacher visited the United States, staying for months. Huang continued to train and his knowledge increased under Wang’s careful tutoring. Around 1983, he started looking for another city to base his operations. He considered several places – like Texas, California and Florida – but ultimately concluded that he would return to the Washington DC area, where he had first arrived ten years prior. In 1986, Huang assembled another team to participate in the 5th World Kuoshu championship. Huang served as Head Coach of the U.S. team. Joining Huang in 1986, as he had in 1980, was his student Joe Dunphy. In 1980, Dunphy took 2nd place in the Infinite weight division for full contact fighting. In 1986, Dunphy took 1st place in the same category. Huang solidified his reputation in the world of full contact fighting. Ironically, while Huang served as head coach for the U.S. team, Huang’s teacher served as head coach of Taiwan team. By this time, Huang had mastered much of his teacher’s curriculum – northern styles, Tai Chi Chuan, Pa Kua Chang, Hsing I Chuan, Shuai Chaio, Chin Na, weapons forms, fighting training, nei kung, chi kung and meditation. More importantly for Huang, however, was when in 1981, Wang selected him as a disciple. Grandmaster Huang later learned that he was Grandmaster Wang’s only full disciple, and ultimately, the lineage heir to the Tien Shan Pai system. During a visit in 1985, Grandmaster Wang presented Huang with a set of three calligraphic inscriptions to hang in his school. One of these panels read: “As you enter to study the art, you must respect your teacher and remember that virtue is more important than any technique.” To this day, that panel hangs in Huang’s school and it is a quote often cited by Huang. For Grandmaster Huang, his involvement in the martial arts has meant more than just training and teaching. He has walked another path – as tournament promoter. In the 1980s, Huang started working with the United States Kuoshu Federation (USKF). In 1980, Pai Lum Grandmaster Daniel Pai – then President of the USKF – invited Huang to participate in the organization as a Vice President. Huang worked with the USKF for the next decade, serving as Head Coach for the U.S. teams to the World Kuoshu Championships in 1986 and 1989. In addition, Huang started hosting his own tournaments in Baltimore in 1988 and 1989. At these tournaments, he revived the ancient practice of fighting on a raised platform – a Lei Tai – which has become synonymous with full contact Chinese style fighting. In 1990, Grandmaster Huang moved into a greater leadership role for Kuoshu in the U.S. by forming the USCKF and was elected President of that organization. In this role, he has sponsored and directed tournaments every year since 1991. And with each passing year, these events have become more prestigious and better attended. In 2002, the USCKF hosted over 700 competitors for Chinese style competition – certainly one of the largest such tournaments available in the world today. Even though Huang seems to have been at the forefront of these federations, he is not one to stand in the spotlight. He is always looking to promote other martial artists. Each year, he invites Masters to give seminars or to perform at his tournament. 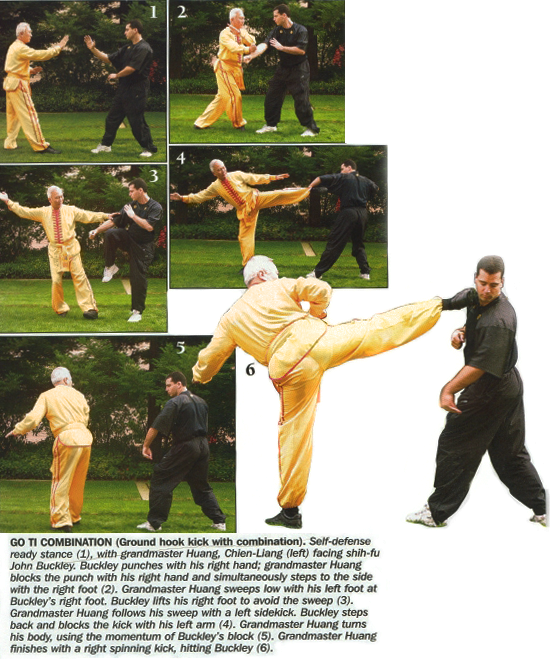 In 1994, he sponsored legendary Yang style Tai Chi Chuan Grandmaster Fu Zhongwen’s first and only trip to the United States. Huang also puts his students in leadership roles – his tournaments of the past 14 years have been directed and managed by his students. Grandmaster Huang spends a significant amount of time each year traveling – to teach or to support other martial artists with their tournaments. His travels have taken him to Asia, South America and Europe. His students have opened several schools in the U.S., Europe and South America, and he frequently visits to conduct seminars at these schools. He has also produced some videos on his martial arts knowledge, including subjects like Tai Chi Chuan, Hsing I Chuan and Tien Shan Pai kung fu. For Huang, there never seems to be enough time to focus on writing articles and developing instructional tapes. His commitment to the community extends beyond the martial arts world. Over the past dozen years, he has developed numerous charity events, raising thousands of dollars for the Johns Hopkins Children’s Center, Multiple Sclerosis research, and for the September 11th fund. In 2000, the Chinese martial arts community recognized Grandmaster Huang’s efforts by inducting his as the first member of the U.S. Kuoshu Hall of Fame. This new and prestigious martial arts award requires inductees to meet a variety of criteria, including minimum experience, age, and other credentials. Each nominee’s credentials are submitted to a committee which then votes on whether the candidate will be successfully admitted. The past thirty years have been successful for Grandmaster Huang. Yet, he is always working – developing the projects that he will occupy him for the next thirty years. One such project is the recently formed The World Kuoshu Federation (TWKSF). It is an international federation for promoting Kuoshu. Through this organization, Huang wants to develop high standards for world-level competition. Members can be as large as a national martial arts organization or as small as an association of a martial arts style. Continuing to promote Tien Shan Pai is another significant goal. There is some confusion about the nature and origins of Tien Shan Pai and Grandmaster Huang wants to broaden the public knowledge about this style. Furthermore, he would like to see more schools teaching this style. Already, he has received several inquiries from Masters who would like to associate themselves with Huang’s International Tien Shan Pai Association or from teachers who learned some Tien Shan Pai and would like to continue their training. Jonathan Pett Miller is a 65th generation disciple of Grandmaster Huang Chien-Liang and focuses his training on Tai Chi Chuan, martial chi kung and Tao meditation. He also serves as Secretary General and Executive Board Member of the U.S.C.K.F. 64th generation Grandmaster of Tien Shan Pai. Thirty years, starting in 1973. Tien Shan Pai, Northern Kung Fu styles, Tai Chi Chuan, Pa Kua Chang, Hsing I Chuan, Chin Na, Nei Kung, Martial Chi Kung and Meditation. Chairman of the Board, The World Kuoshu Federation (TWKSF). President, United States Chinese Kuoshu Federation (USCKF). Owner and chief instructor, U.S. Kuoshu Academy. Served as Head coach of U.S. team to World Kuoshu Championship tournaments and international Kuoshu championship tournaments from 1986-2000. Trained two world champions in Kuoshu full contact fighting – Joe Dunphy (1986) and Dwayne Harrell (1996) – and trained three gold medal winners in world form competitions – Ian Chisholm and Eric Lee (1992) and Ian Chisholm and Cory Ricks (1996). Trained world champions for second and third place ranking in fighting and forms; trained first through third ranked champions in fighting and forms at international Kuoshu tournaments. Organized and hosted 14 national and international Kuoshu tournaments from 1988 through 2002. Most recent tournament featured over 700 competitors for Chinese style competition. Wrote and published articles on Hsing I Chuan and meditation. Produced videotapes and DVDs on Tai Chi Chuan, Hsing I Chuan, Chin Na, and Tien Shan Pai Kung Fu. First inductee into the U.S. Kuoshu Hall of Fame – 2000. Recognized by U.S. Congressmen, Senators and Governors for his work on promoting Kuoshu. Selected by “Inside Kung Fu” magazine as one of the Most Influential Chinese martial arts masters of the past 30 years.